Jean-Luc Godard is a French-Swiss filmmaker and film critic best known for his involvement in the influential film movement La Nouvelle Vague or New Wave during the 1960s. 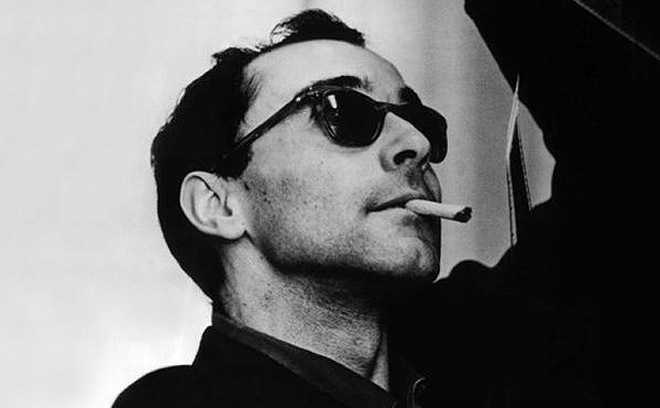 Godard's career began in 1952 as a writer and critic for the esteemed film magazine Cahiers du Cinéma. It was here that Godard, alongside future auteurs like Éric Rohmer, Jacques Rivette, Claude Chabrol, and François Truffaut, helped re-invent the rules of film theory and criticism. Godard's films are primarily introduced and pushed forward through a liberal use of typography, from the opening title sequences, through various intertitles, up until the end ("Fin") titles. Like early silent films, Godard used many intertitles, making typography an essential part of his storytelling.